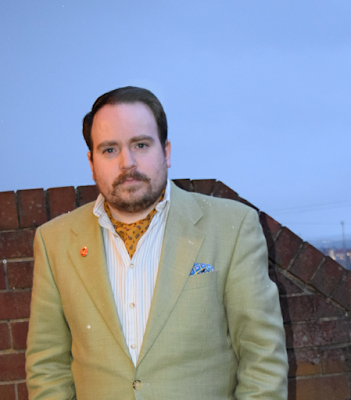 When the weather is as unpredictable as something terribly unpredictable, one is put in a sartorial quandary. Especially early in the morning when such a decision needs to be made quickly and decisively, in between coaxing my children from bed, to breakfast, to brushed and ready for school. Thankfully, I have a lovely lightweight wool jacket which helps keep me cool when it's sweltering and warm when it's wailing. Made in Italy, a country that knows how to combine style with sunshine, it is from a brand called Benvenuto. I managed to pick it up for £1.99 in Barnardo's. The beneficiary boutique manageress informed me upon purchasing the garment that lots of men had tried it on but it had proven to be a tricky fit. It was marked down as a 52" jacket, when I usually take a 42", which may explain why a succession of larger men had unsuccessfully squeezed their torsos into it. 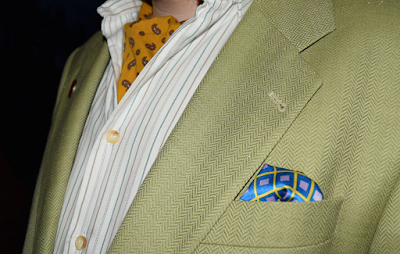 The green herringbone is very striking indeed. Definitely a summery shade. It has a ventless back so bunches up when walking around in a louche manner with a hand in the pocket. 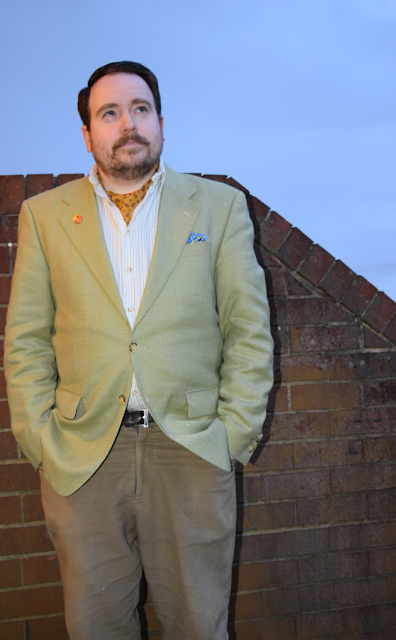 Featuring two horn-effect buttons, I paired it with an old M&S country shirt that also has the horn. A cotton cravat picked up from Messrs E&Bay was selected, along with a Pretentious Pocket silk handkerchief to add a little flamboyance. 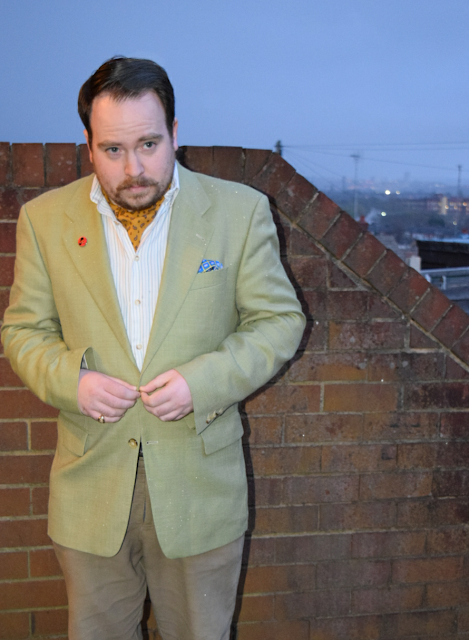 To keep my legs covered and spare my blushes, I plumped for a pair of moleskin trousers in a lovat beige. 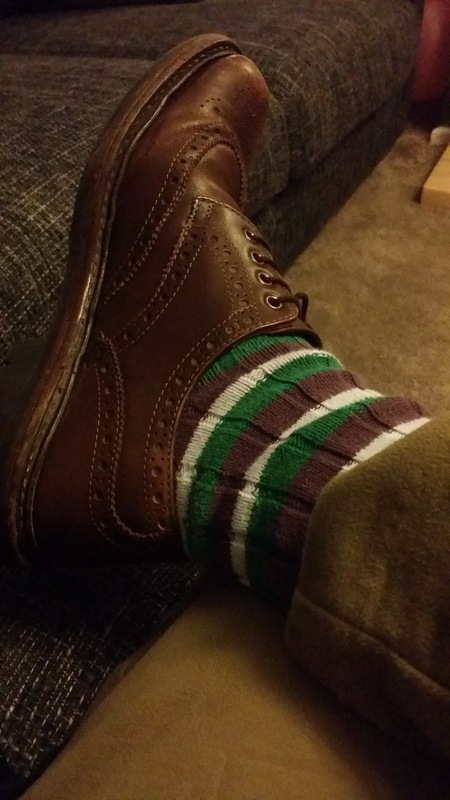 Below are my trusty oxblood country brogues from Barbour and colourful made in England socks. Re. the size, continental Europe uses a different system of numbers, a "52" is in fact equivalent to a British "42". Fabulous jacket - and a bargain price. I had no idea Euro menswear sizes were so different. We've had lousy weather down south too, it's even snowed.